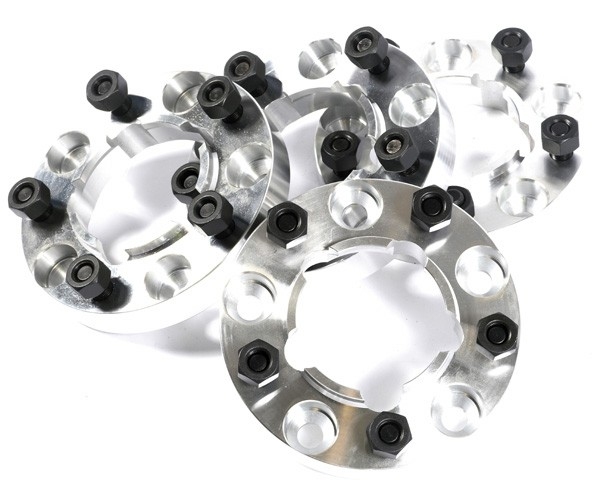 <b>30mm Wheel Spacers</b><br> <br> Terrafirma 30mm aluminium billet wheel spacers give an additional 60mm track width to Defenders,<br> Discovery 1 and RR Classics. <br> The improvements are in handling, cornering and stability as well as increased steering lock.<br> <br> The opportunity to fit larger tyres due to the increased steering lock is a bonus not to mention the <br> improved 'stocky, planted' look to the vehicle.<br> <br> Alloy wheel spacers do not effect wheel balance like steel ones can and please note these quality <br> wheel spacers include the important wheel location spigot.<br> <br> 30mm Billet Aluminium <br> Wheel Locating Spigots. Discovery 1 and RR Classics. improved 'stocky, planted' look to the vehicle. wheel spacers include the important wheel location spigot.